To say this has been an amazing, whirlwind, exhausting month would be a serious understatement. 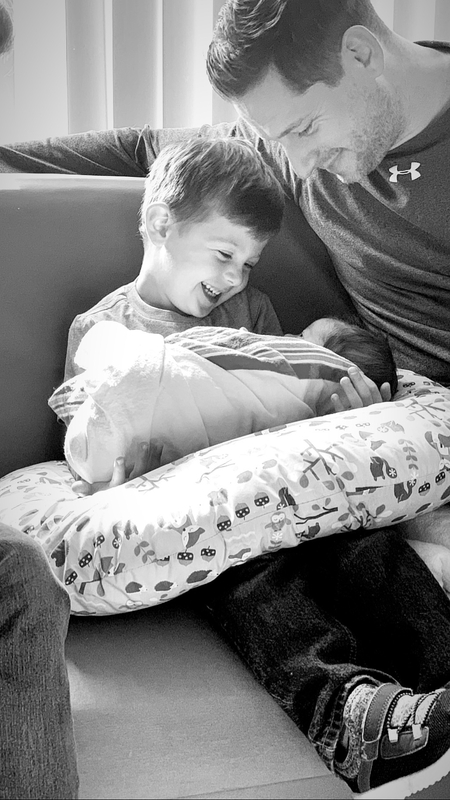 On March 7th, we welcomed our second son, Finn Thomas into the world, and we’ve all been smitten ever since. Especially Big Brother Kieran, which is just about the best thing ever to witness. That picture says it all. Kieran has been absolutely AMAZING as a big brother. He loves it even more than we could ever have anticipated. He’s so sweet, gentle, and patient with Finn. The only adverse reaction he’s had is getting upset himself when Finn cries. He worries that he’s hurt or sad when he cries, which makes Kieran cry too. And then I cry as my heart explodes into a million little pieces. For now, I’m soaking up all these moments and trying to preserve them in my mind forever. I forget so much of Kieran’s newborn stage, so this time, I’m trying to be better about living in the moment and soaking it all up. In the midst of this awesome change to our family, I gathered up some new favorites to tell you about. I have been loving these so much this past month! First up are my Allbirds. You guys. I drank the Kool-Aid. I had been debating getting a pair of these shoes for a couple months after seeing them all over the place on social media. Then, in a moment of self-pity about still being pregnant at 40 weeks + 3 days, I bought them. And they are the best thing I’ve bought in ages! They are seriously the most comfortable shoes I’ve EVER owned. Both my pregnancies made my feet widen, and since having Kieran, I’ve had a harder time finding comfortable sneakers in a wide enough size. These are AMAZING. Not only are they super supportive, but the all-fabric top stretches in the best way. I’ve walked around in these for hours on end and have never had any issues. I already convinced my mom to get a pair, and I’m thinking about getting another pair in another color. I have the dark gray, which is perfect since I wear black leggings 90% of the time, haha. I cannot recommend these enough. This Hourglass Caution Extreme Lash Mascara has been my newest fave make up addition. I switch back and forth between “luxury” mascara and drugstore mascara all the time. I think there are certain drugstore mascaras that totally get the job done. My one beef with them? They’re often super drying to my lashes. They end up flaking and getting dry, which makes my lashes fall out. This Hourglass mascara gives me all the length and volume that some cheaper versions do but without drying things out. It’s been an awesome addition to my make up bag. These leggings! OMG. I have been LIVING in these postpartum. Not only do they offer incredible high-waisted compression, but they’re so soft and luxurious. AND you can’t see through them at all! I won’t say that they are miracle leggings or anything (do they even exist? ), but they make me feel sucked in and supported during this less-than-glamorous, post-birth recovery time. And you really can’t beat that price! Vital Proteins Collagen Water. A few weeks ago, Vital Proteins offered a free sample of their new collagen waters, and I jumped at the chance to try it. While I was a bit skeptical that it would taste good, the strawberry lemon flavor has been a pleasant surprise! It’s light and refreshing and serves as a nice alternative to plain water (which I drink a TON of). I WILL say that the taste of collagen is more prevalent than the peptide powder (which I mix into smoothies and coffee all the time). So if you are sensitive to that taste, these might not be for you. I am hoping to try a few of the other flavors – blueberry mint is next on my list! In other beverage news, I have been obsessing over WTRMLN water. I used to drink this all the time before getting pregnant, but while preggo, I avoided all raw juices. But now! I’m guzzling these a couple times a week. They are such a treat, and like the collagen water, a nice departure from plain water. L-O-V-E. I have my sister to thank for this next discovery: Esti hummus. This is absolutely, hands-down the best hummus I’ve ever had. The lemon flavor is the best I’ve tried so far, but the caramelized onion flavor is also awesome. It is the fluffiest, smoothest, creamiest hummus ever, and the flavor is sooo good. The only problem? They are sold locally in northern NJ only. Luckily, my sister lives up there and she has been tasked with bringing me a few containers of this hummus every time she visits. It’s working out well (for me). Haha. The Glow Baby app. For anyone with a newborn, this is a total lifesaver! It allows you to track all feedings, which side you last nursed on, diaper counts, and more. I don’t even use the paid “premium” version, and I love it. It’s the only way I’ve been able to keep track of everything with Finn these past few weeks. Game changer for new moms, for sure! This next one is going to sound weird, but I have been obsessing over Greek salads as of late. I have always been a huge fan of Mediterranean flavors, but for some reason, the briny flavors of feta cheese and olives have been reigning supreme lately. A local pizza place makes THE BEST Greek salad I’ve ever had. The funny thing is, I don’t think they do anything particularly special for the salad, but for some reason, it tastes so unbelievably good to me right now. It’s basically mixed greens, bell peppers, cucumbers, red onions, avocado, hardboiled egg, kalamata olives, tomatoes, and a big hunk of feta cheese. It’s tossed in a light oregano vinaigrette, and it is perfection. I could totally make this myself (and I have before), but for some reason, the take-out version is everything to me at the moment. I can’t even tell you the last time I was so excited to eat SALAD. So, so good. Bear Naked granola bites. Because I’m nursing/juggling the needs of a newborn, I am constantly on the hunt for easy, pop-in-my-mouth-as-fast-as-possible snacks. These granola bites have been so great. I love the honey peanut butter and dark chocolate trail mix flavors. I actually keep a bag on my nightstand because when I nurse Finn in the middle of the night, I am usually starving. A quick handful of these granola bites does just the trick when I need a little something but can’t/don’t want to eat a full meal. Breastfeeding hunger is REAL, people. These have been a great staple! Even though I already raved about these in last month’s favorites post, I must mention again how much I am still loving my Biossance products. Both the moisturizer and renewal facial are regulars in my rotation, and they make an actual noticeable difference in my skin. I already need to restock on the moisturizer! Definitely worth a re-mention. What have you been loving this month? I am so looking forward to April. It is the first month that truly feels like spring to me!